It’s a sorrowful Pride Month. People are adorning their chests with rainbow ribbons, mourning the lives lost, calling the world crazy. Yet nothing is halting the festivities. If anything there’s never been a better time to be proud, or loud, or at least active. Never a better time to celebrate, despite. That’s who we are as a community! We show love and accept each other, and we throw festivals to celebrate our identity because the minority still denies it. In this Nerd Chord I’m talking about how and why we (nerds) love, as usual, but I’m also doing whatever I can about the tragedy in Orlando. I’m putting that love at the forefront and shifting the discussion to a couple of the most important, affecting films in pop culture that center on gay themes and gay characters. My boyfriend and I have this thing called “Moviebitch,” where each of us requires the other to watch a favorite movie he has not seen. He’s been exposed to a lot of Studio Ghibli movies, but I’ve had the keen pleasure of discovering those universal (often international) gems in film that happen to focus on the gay community (and shared a few myself). 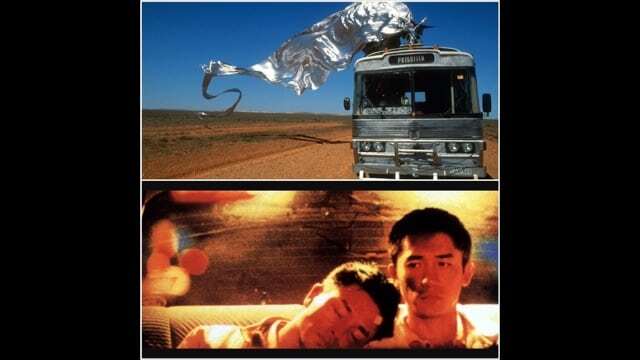 One such film was 1994’s The Adventures of Priscilla, Queen of the Desert—a piece of cinema that belongs with Muriel’s Wedding and Strictly Ballroom on a list of the best movies to come out of Australia in the ‘90s. In this comedy, the happily obnoxious Adam (Guy Pearce) is young and sensitive to the world’s cruelty. Fellow formidable transwoman Bernadette (Terence Stamp) has thicker skin but recently lost her partner. Last, Tick (Hugo Weaving) is a man estranged from his wife and young son. He collects Adam and Bernadette, and together the three drive across the Australian outback to perform in a drag residency show. But Tick also knows he will reunite with his family. Here is a road-trip movie that does as most of them do: it chronicles an odyssey during which the characters seek things, transition from things, and reach epiphanies–all very human activities not exclusive to the LGBT community. But these three are sent off from their community with a huge party and a crowd joyously chasing after their RV (dubbed Priscilla, Queen of the Desert by Adam, ever irrepressible). On the road, even the desert teems with life both wild and indigenous; one of many unforgettable scenes includes an impromptu drag show for a group of partying aboriginals in the middle of nowhere. 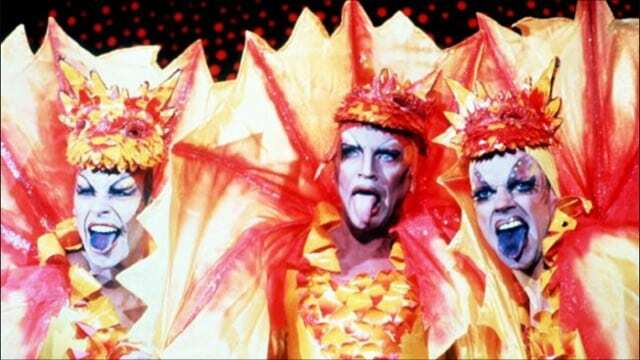 Priscilla stands apart in its unabashed depiction of life as a happy affair; it’s stuffed with camp and, for 1994, gives an unexpectedly upbeat story of a group of people less hindered by the darkness of the AIDS pandemic and more hopeful for their future. During these adventures, Priscilla is vandalized with the message “AIDS FUCKERS GO HOME,” but then with a few coats of lavender paint we see the kind of unyielding spirit so important to anyone who bears discrimination. On their adventures the three find love and stand up to a group of homophobes, etc., but it’s Tick’s complicated relationship with fatherhood that culminates in a moving scene of mutual acceptance. We realize the drag performances are a display of unconditional love not only for each other but also for themselves; it’s not just a way to survive. Another Moviebitch selection: 1997’s Happy Together. In this film from Hong Kong, Lai Yu-fai (Tony Leung) and Ho Po-wing (Leslie Cheung) are always choosing to “start over.” With this latest new beginning the two take a trip from Hong Kong to Argentina. It’s not long before they dissolve into a discontented mess of arguing and stewing in Argentina while on their road trip to see the Iguazu Falls. They never make it to their destination, but instead they separate. Disillusioned, Lai Yu-fai finds work so he can afford a ticket home then ends up tending to a broken Po-wing. Again they start and stop, and one of them finds new life while the other crumbles and shatters. They want different things. Writer-Director Wong Kar-wai’s characteristic visual style perfectly complements the decaying romantic relationship between Lai Yu-fai and Ho Po-wing. Similar to other masterpieces from this director—like In the Mood for Love and Chungking Express—Happy repeatedly uses a palette of vibrant colors but obscures them behind some veil or object; the cinematography is beautiful and often poetic in its implications of missed connections and misunderstandings. Wong Kar-wai’s screenplay completes the emotional punch, particularly in voice over when Lai Yu-fai talks as though he were writing his most private thoughts in a journal. His comments are intensely personal and revealing so that whenever we see the room in which the two had been happy together, even the props resonate with the history of this couple and their time on the opposite side of the world. The mood here is incredibly palpable. It establishes a deepness of connection you only expect to see, not to feel. And it leads to a bittersweet conclusion that always leaves me at once tied in knots but also stretched from end to end (this is a good thing). If anything, this reaction confirms the universality of romantic love: it’s just a movie, and yet it represents a form of love—an identity—still outlawed in many parts of the world. You’ve noticed both these films come from other countries, and maybe by now you see how they defy boundaries. All of these characters are searching for something, and some of them are yearning, but none of them need to live with shame. They’re unapologetically gay, and they get by on the closeness in their lives. We can’t all live like that because, in some cases, culture and/or law prohibits it. So, fighting for representation and equality–being active and proud–is the correct meaning of our “lifestyle.” Hateful assaults on that lifestyle make us more defiant, more resilient, and infinitely more loving. You can find Happy Together and The Adventures of Priscilla, Queen of the Desert on Amazon Video.